People are like snowflakes. No two are the same. This is very much the case in Dan Fingerman’s fervent dramedy Boys of a Certain Age. Boys of a Certain Age is a story about being a gay male in America that illuminates just how different each person's journey can be. Written by Dan Fingerman, Boys of a Certain Age follows a chilly weekend away at Ira’s beach getaway. His recently out nephew Christopher suddenly shows up looking for solace as Ira’s childhood companion Larry and his son Bryan are set to arrive. The quartet offer stories of sexual escapades and jabs at personal and political beliefs, all while sharing similar experiences being a gay male in society. Fingerman’s text has an old-fashioned sensibility to it, giving the story charm. There is a strong foundation in the structure. The content is dynamite, exploring the dynamics of the generations. 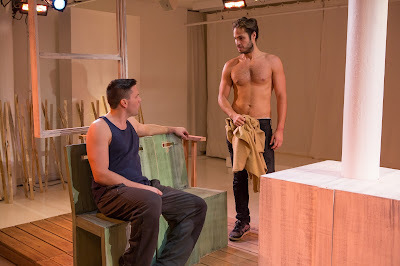 The exploration of gay themes highlight the near mirror images between Ira and Bryan and Christopher and Larry. Living in distinct generations, these two pairs have strikingly similar stories. And it’s an exciting to watch the interactions. The four characters within the piece have a strong, distinct voice, but you can’t help but notice that there is a lot of aggression and a bit of cynicism deep inside in each person. There were arguments a-plenty that kept the conflicts high. The heat was surely on. But what was keeping these people there? There were some big blowups that should have caused some to just get up and leave much sooner. Circumstances of course. As minor as this is, it’s easily fixable. Boys of a Certain Age is a prevalent piece. Fingerman includes a plethora of current topics. And sometime it feels like a Facebook newsfeed. That being said, Fingerman’s dialogue is best when the hot buttoned topics are integrated into the plot and character and relationship development. Director Dan Dinero took this relationship play and highlighted the nuances of these characters as individuals and as pairs. By focusing on how these individuals interacted, Dinero helped to highlight the complexities of Fingerman’s characters. Even when plot twists were surely coming, Dinero allowed them to unfold seamlessly. Maximizing the stage at Theaterlab can be quite difficult. Not only is a white box studio, the giant poles can cause some artists some giant headaches. Scenic designer Joe Burkard not only utilized the center pole well, he highlighted it, making it a literal centerpiece of his design. Thusly, Dinero played with the space quite well, keeping things consistent yet shifting it about. It was a bold choice that paid off. With a room of white, lighting designer Scott Nelson’s splash of color, especially in the bar scenes, gave the play life. As the central cog in the machine, R. Scott Willams as Ira was a hoot. He represented the old-fashioned homosexual. Though he had a sassy, snarky comeback, Willams allowed Ira to have a wealth of experience in his subtext. There was a history deep inside Ira. Playing nephew Christopher, Brian Gilgor took on the gay Republican and tried to make him affable. Gilgor’s Christopher was a bit rigid, especially next to Marc Sinoway’s Bryan. Sinoway’s Bryan was the embodiment of ego. Even with strong opinions and ideas on love and life, Bryan had a giant wall that blocked him from allowing anyone in. Though this is likely rooted to the predictable twist that was revealed late in the game. As the man who recently found himself, Joseph J. Menino’s Larry didn’t shine bright, often fading into the background. It allowed the heart-felt explosion to be quite worthwhile. Boys of a Certain Age is an engaging piece of theater with an exuberant amount of sentiment. It’s rich with history with a modern sensibility. If you’re not “in” on the culture, it’s easy to feel left out of this play. But for those who know this experience, Boys of a Certain Age is a special play.